Bichon frise dogs typically have white, textured coats. Bichon frise dogs are playful, friendly companions that make great family pets. After bringing your bichon frise puppy home, one of your first tasks will be to potty-train him. 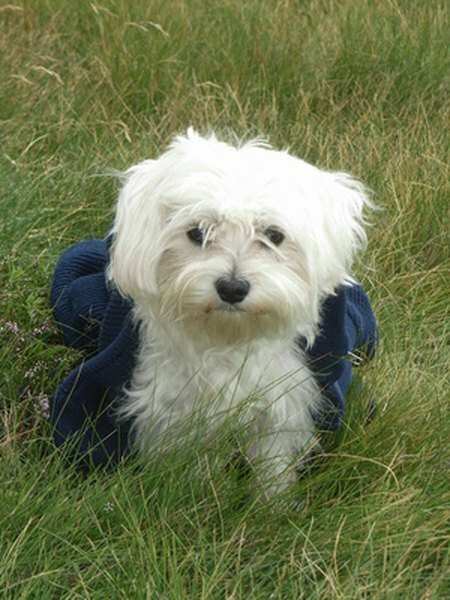 Do not be overwhelmed by the thought of training your dog to do his business outdoors -- crate training is a simple potty-training method that can be remarkably effective for bichon frise puppies. Understand that the purpose of keeping your bichon frise in a crate is not to punish him -- it is to teach him not to have accidents in the house. Even after your bichon frise has been potty-trained, he should feel comfortable spending time in his crate when he wants to take a nap or needs some time to himself. The crate will ultimately become your dog's security spot. Purchase a crate for your bichon frise that is just large enough to hold a dog bed. Your dog should be able to stand up, lie down and turn around in the crate; but there shouldn't be much extra space. Take your dog outside every few hours and lead him to the designated "potty area" in your yard. Training your dog to do his business in a certain section of the yard will make cleaning up after him much easier for you. Wait for your bichon frise to do his business, then praise him excitedly and offer him a small treat. Praising and rewarding your dog for good behavior will increase his likelihood of repeating the desired behavior. Keep your bichon frise in his crate overnight and during long absences. Because dogs have a natural aversion to soiling their dens, keeping your puppy in his crate when you cannot supervise him will reduce the frequency of accidents. 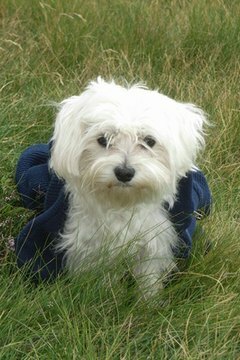 Take your bichon frise outside and lead him to the potty area as soon as you release him from the crate. Continue to praise and reward your puppy when he does his business in the potty area as directed. Try incorporating a command phrase like "go pee" when you take your dog over to the potty area. Over time, your dog will connect the command with the behavior. Eventually, you will be able to open the door for your dog and give him the command phrase, and he will go to the potty area on his own and do his business. Be patient and consistent with your bichon frise throughout the training process. Do not punish your dog if he has an accident during potty training -- just keep praising and rewarding him for good behavior. Supervise your dog closely while you are in the house, watching for signs that he has to go. If your dog begins sniffing at the ground and walking in circles, he probably has to go. Take your dog out as soon as you notice these signs. It may be helpful to limit your dog's range in the house during the potty-training process so you can keep an eye on him more easily. Keep bedroom doors closed and use baby gates to keep your dog confined to whatever room you are in. Never punish your dog for having an accident in the house -- and absolutely do away with the notion of rubbing his nose in it. Not only will your dog be unlikely to connect the punishment with the behavior, but he could end up developing fear toward you, which will hamper the training process. Do not keep any water or food in the crate with your bichon frise, as doing so could make it more difficult for him to hold his urge to go.